Taylor Kitsch makes some new friends as John Carter. 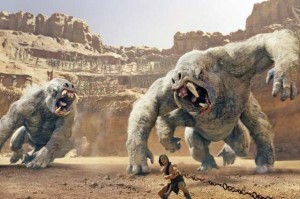 John Carter, the lavish science-fiction action epic that, er, didn’t take the world by storm this spring, hopes to make up for lost audience shares on disc–a mere 100 days following its premiere on 3,800 screens around the country. Based on the adventures of John Carter, the protagonist of writer Edgar Rice Burroughs’ 11-volume Barsoom series of novels (1912-43)–also known as the “John Carter from Mars” series–the film zooms in on Civil War captain John Carter (Taylor Kitsch, Friday Night Lights), who’s inexplicably transported to the mysterious and exotic planet of Barsoom (Mars). It’s a world on the brink of collapse, and Carter rediscovers his humanity when he realizes the survival of Barsoom and its people rests in his hands. Demonstrating his surprising new outer space powers (like being able to defy Barsoom’s gravity) and engaging in large-scale battles with Barsoom’s various factions, John Carter rises to become the man he is meant to be and the hero he truly is. The first live-action film directed by Pixar veteran Andrew Stanton (WALL-E, Finding Nemo), John Carter co-stars Lynn Collins (City Island), Samantha Morton (The Messenger), Mark Strong (Green Lantern), Ciaran Hinds (Tinker Tailor Soldier Spy), Dominic West (Centurion) and Willem Dafoe (Antichrist). Disney Second Screen – Explore John Carter’s journal with this innovative in-world experience and uncover a trove of fascinating details that extend the mythology of the movie. 360 Degrees of John Carter – Experience every aspect of the filmmaking process on one of the movie’s biggest production days. 100 Years In The Making – Follow the journey of Edgar Rice Burroughs’ story, from its origins as a pulp novel to its arrival onscreen.